Your Closed Card-Sorting analysis will use several different views. The Maximum Agreement view displays a compiled results set where cards are placed in groups of the highest percentage placement. The agreement is displayed to the right of the card name. When a card has the same highest percentage for multiple groups the card is displayed in ALL of those groups and the percentage highlighted. The agreement value should be carefully considered on this table. The lower the agreement, the less confidence you should have in its’ placement. An agreement of 60% means means that 40% of the participants didn’t put the card in that group. In instances like this it is necessary to understand the other places the user has placed the card. 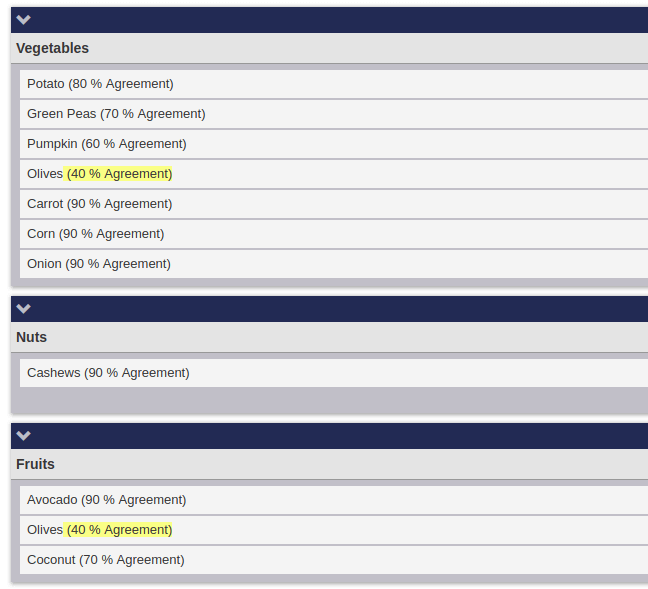 This image shows that the card 'Potato' was placed in 'Vegetables' by 80% of participants while 'Olives' was place equally between the groups 'Vegetables' and 'Fruits'. 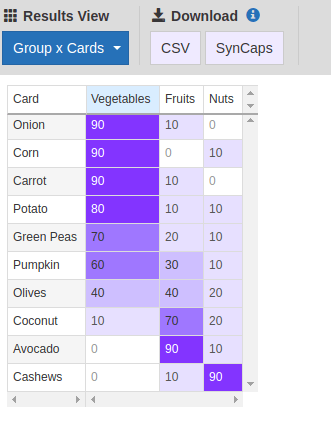 The Groups x Cards table displays the percentage of time a card is placed in a group. The first column shows the list of cards, and the remaining columns show the group name in the header. A value of 100 means that all participants placed the card in the group. This view is especially useful when understanding all the places that a card was placed when the maximum agreement is low. Click the column headers to sort the cards in the group. 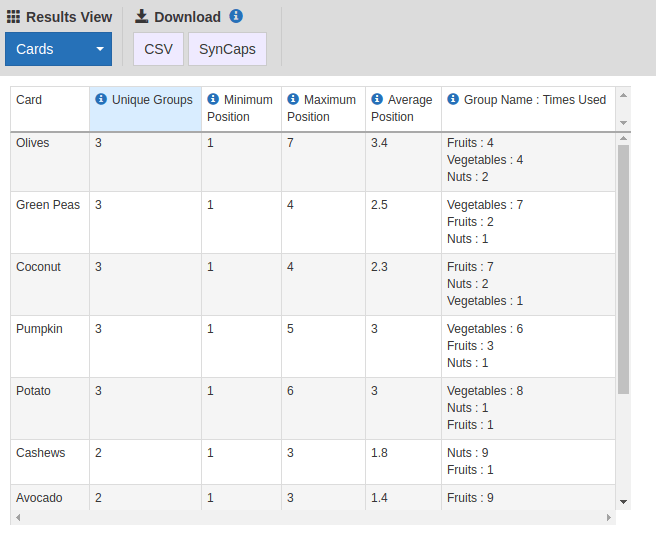 Using our example sort you can see that 'Olives' was placed 40% of time in 2 groups, and 20% in the remaining. The cards view is perfect for understanding which cards had the most ‘unique groups’. The first column of this view will tell you how many unique groups the card was placed in. Sorting the column you can quickly find your problem cards - those cards that your participants placed in different places. The cards view sorted on the first column. The groups view complements the Cards view by showing you the same information from the groups perspective. Looking at the agreement column you’ll see which groups your participants had good agreement about the cards it should contain. The higher the number, the better agreement.If you enabled ‘Group Commenting’ in your sort, this is also where you will see those comments. The groups view from our example closed card sort.